The Brannigans bag has a traditional look and feel, which was the aim when it was designed. The logo is very dull and dated (it should look like a vintage shop sign). 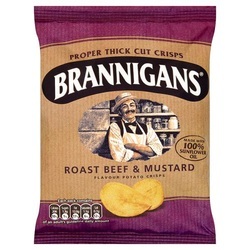 The image of Mr Brannigan, a jovial and moustachioed retailer is good and the bags are flavour colour coded. We don't know why KP didn't add an apostrophe in the name, but maybe now that European owners Intersnack have taken the brand on, they might add it! On the other hand they may discontinue the brand before the design gets a much needed update. 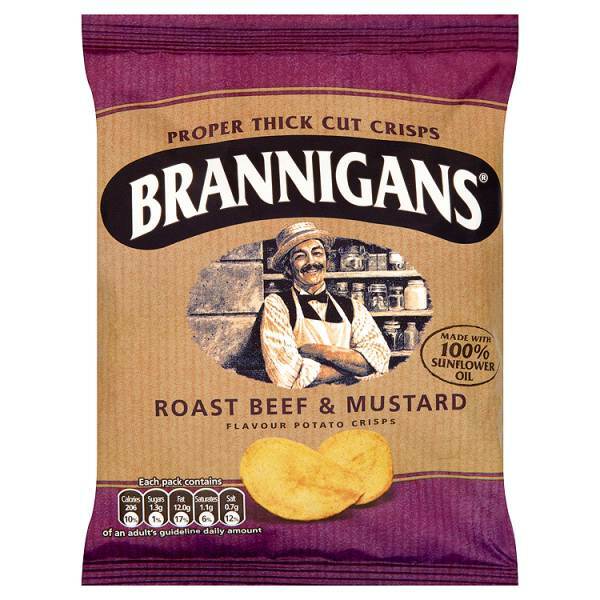 Perhaps appropriately, these Crisps had a thick and meaty crunch to them. It was not audible or sustained, but after an initial snappy break, the Crisps diminished in size at a reasonable rate. These Crisps were particularly flat. When a Potato Crisp is fried you would think it would suffer some pain. There were very few oil bubbles and not many curly bag constituents at all. This may have been partly down to the fact that the Crisps were thicker than the average Crisp. There was skin visible on edges and copious amounts of light brown seasoning, which was intriguing. The very faintest smell of Mustard was apparent when the bag was opened. The taste was clearly of mustard, and it wasn’t any old mild mustard, it was English Mustard – maybe even a very mild and creamy Wasabi. There was also a nicely balanced meaty Beef flavouring to the Crisps.